SUPERIOR TOWNSHIP, Mich., Dec. 2, 2016 – A Value Edition comes to the already economically priced, feature-laden Accent for the 2017 model year. At just $16,450, the Value Edition costs but $705 more than the base Accent with 6-speed automatic transmission, yet includes several desirable features. Now the Accent crams even more content into its small-on-the-outside, commodious-on-the-inside, IQS-segment-winning shell. An all-aluminum, 1.6-liter four-cylinder engine, called Gamma, propels the Accent. It produces 137 peak horsepower at 6300 rpm and 123 lb-ft of torque at 4850 rpm. The Gamma makes use of several advanced technologies like Gasoline Direct Injection (GDI), Dual Continuously Variable Valve Timing (D-CVVT) on both intake and exhaust camshafts, and a variable length intake manifold. To reduce lifetime operation costs and increase reliability, the Gamma engine features a maintenance-free silent roller timing-chain. 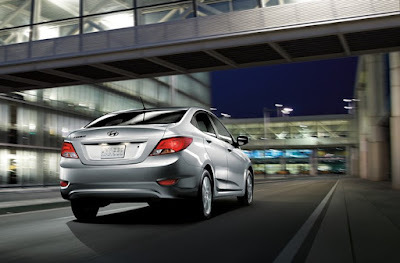 The Accent comes with either a six-speed automatic or manual transmission. With the manual, the Accent achieves an EPA-estimated 27 city, 37 highway, and 31 combined mpg. COMPACT YET COMMODIOUSDespite similar exterior dimensions to many of today’s traditional subcompacts, the EPA classifies the Accent as a compact sedan, rather than subcompact, due to its over 103 cubic-feet of interior volume as a sedan and 111 cubic-feet as a hatchback. The five-door also offers more cargo behind the rear seats than a Honda Fit. Hyundai sprinkled convenient storage spaces throughout the cabin, including larger bottle holders in the front doors and a storage tray at the base of the center console. An available sliding armrest adds even more storage options. The Accent’s rear seats split 60/40 and fold for increased cargo flexibility, making it a handy IKEA™ hauler as well. SAFETYSix airbags help protect occupants in the event of a collision: two front airbags, as well as driver and passenger side and curtain airbags, which protect both front and rear passengers. The Accent’s standard front-seat active head restraints help prevent whiplash by automatically reducing the space between a front occupant’s head and the restraint during certain rear collisions. All this is in addition to a cadre of standard passive safety features like Electronic Stability Control (ESC), Traction Control (TCS), and Vehicle Stability Management (VSM), which integrates control of the ESC and motor-driven power steering (MDPS) to provide handling assistance in slippery conditions and emergency maneuvers. The system delivers counter-steering when required to assist the driver and keep the vehicle stable. HYUNDAI MOTOR AMERICAHyundai Motor America, headquartered in Fountain Valley, Calif., is a subsidiary of Hyundai Motor Co. of Korea. Hyundai vehicles are distributed throughout the United States by Hyundai Motor America and are sold and serviced through more than 830 dealerships nationwide. All Hyundai vehicles sold in the U.S. are covered by the Hyundai Assurance program, which includes the 5-year/60,000-mile fully transferable new vehicle limited warranty, Hyundai’s 10-year/100,000-mile power-train limited warranty and five years of complimentary Roadside Assistance. Hyundai Blue Link Connected Care provides owners of Hyundai models equipped with the Blue Link telematics system with proactive safety and car care services complimentary for one year with enrollment. These services include Automatic Collision Notification, Enhanced Roadside Assistance, Vehicle Diagnostic Alert, Monthly Vehicle Health Report and In-Vehicle Service Scheduling.